/ Modified mar 27, 2018 1:01 p.m. 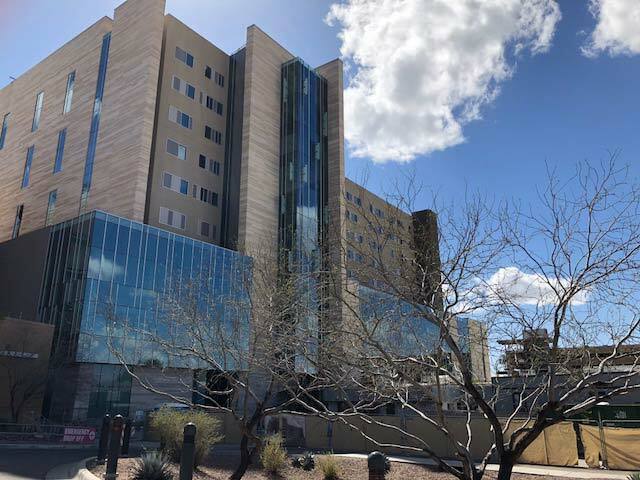 The recently completed tower for Banner - University Medical Center Tucson, March 2018. Free tours of the new Banner - University Medical Center Tucson hospital are scheduled for the next three Thursdays. The nine-story tower will be completed next April and will replace the old hospital, which opened in 1971. Construction on the new building, located just west of Diamond Children's, began in 2016, about a year after Banner Health took over the University of Arizona's medical center in a 30-year deal. Banner is spending $427 million on the new building and renovations to the existing hospital. The building will have a new main entrance, new operating rooms and a new cafeteria. There will be 204 private rooms replacing the double rooms in the original hospital. Tours of the new building will be held from 4 to 5 p.m. March 29, April 5 and April 12. Reserve a spot by calling 520-694-6102. You must wear closed-toed shoes and long pants. Safety helmets and vests will be provided.